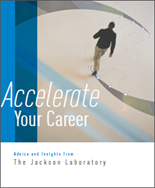 Career advice for science Ph.D.s and postdocs from The Jackson Laboratory. Today, Ph.D.s and postdocs in the sciences pursue a broad range of careers. Many continue with research positions – in academia, industry, biotech or government – but others choose careers away from the bench. Whatever your career goals are, a science Ph.D. is great preparation: you gain valuable communication, management and mentoring skills. Our digital booklet provides advice on how to strengthen those skills, learn more about career options and discover resources to help with your job search.